OK, I'll make this post short, because honestly, you really need to check out the eBay listing for this car. Why waste time, right? The mid-engined Lancia Scorpion was known as the Lancia Montecarlo everywhere except the in US, where Chevy would have had a problem with Lancia using that name. It was imported into the US in 1976 and 1977 and was ultimately replaced by the Lancia Beta Zagato (see my earlier post about that car) in the US lineup. Mid engine, rear wheel drive, Pininfarina styling, there is no doubt this is a true Italian sports car. However, while most of the world got a 2.0 liter engine, the US, due to tighter emissions standards, had to settle for a 1.8 liter engine. Performance was adequate, but certainly did not match its looks. Forget about the performance, though. That can be improved, if you so desire. This is a car you buy on its looks. The Scorpion is just a beautiful car. Period. Scorpions rust, like all 70s Lancias do, and parts are not easy to come by in the US, but with the car featured here, you shouldn't have to worry about any of that for quite awhile. As the seller states, it's a turn key Scorpion. It's certainly one of the nicest I've ever seen. Enough of what I have to say. Go check out this eBay listing. There are a ton of high quality pictures and a few videos. Even if you're not in the market for a Lancia Scorpion, it's great eye candy. Click here to see the listing. 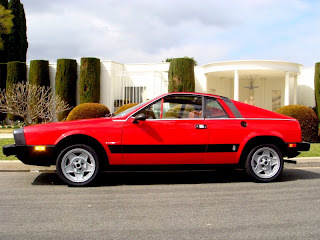 For more info on the Lancia Montecarlo / Scorpion check out Lanciamontecarlo.net, an enthusiast site dedicated to the cars. Oh my god...a Yellow/Silver Yugo Cabrio AND a Lancia Scorpion (with the solid panel rear buttress) on the same page?! Are you in my head or something?! Jeez...all of my bizarre automotive unicorns are coming together here on this site. I loved this car in Junior High...god I wanted it badly.